Scientists expect this year globally to be the fourth-hottest on record, with the only warmer years being the three previous ones. Since 2001, we have lived on a planet that has experienced seventeen of the eighteen hottest years ever observed. The alarming temperature records set over the past two decades are consistent with a century-long pattern, rigorously confirmed by multiple lines of scientific evidence: the burning of fossil fuels has driven a rise in heat-trapping greenhouse gases (GHG) in the atmosphere, which has already caused nearly a 1 Celsius (C) degree rise in global temperatures. The impact from destabilizing Earth’s climate system are being felt by people living in every country of the world. This summer, record heat in Japan and elsewhere caused dozens of deaths. Firefighters in California struggled to control the largest forest fire on record, one of about twenty that ravaged the state. Forest fires also raged across Canada and even in the Arctic. In Europe, where fires led to deaths in Greece, record-setting heat also severely damaged crops and caused other freakish events. Rivers were so warm in some places that some nuclear reactors had to shut down because the water was too hot to cool them. Teasing out the unique role played by human-caused climate change in contributing to extreme weather events (in comparison to natural fluctuations) has long been a scientific challenge. But in recent years research in the area of “attribution science” has developed into a mature field. To date, scientists have published more than 170 reports covering 190 extreme weather events around the world, according to an analysis by the journal Nature. About two-thirds of extreme weather events studied were determined by scientists to have been made more likely, or more severe, by human-driven climate change. Heat extremes accounted for 43 percent of these events, followed by droughts (18 percent) and extreme rain or flooding (17 percent) (Schiermeier 2018). Acknowledging the threats posed by human-caused climate change, in 2015 almost all of the world’s countries pledged as part of the United Nations climate treaty to keep global temperature rise this century to lower than 2 degrees C above pre-industrial levels and to strive for a 1.5 degrees C. But to achieve this goal, greenhouse gas emissions would need to be cut by at least 70 percent by 2050 (Tollefson 2018). As the shift away from fossil fuels to low carbon energy moves at a snail’s pace compared to what is needed, in 2017 emissions worldwide rose by nearly 2 percent, the first increase in four years. In an August 2018 lead editorial at The Economist, the typically optimistic magazine put the state of progress in the bluntest of terms, running the headline: “The World is Losing the War on Climate Change” (“The World” 2018). In countries around the world, to replace fossil fuels the massive deployment of solar and wind power will likely need to be supplemented by thousands of advanced nuclear power plants; natural gas plants that capture and bury their emissions; and a gigantically bigger, more powerful, and vastly more complicated energy transmission and storage system. These are just the challenges in decarbonizing the electricity sector. Equally daunting obstacles exist in the agriculture and transportation sectors (Temple 2018). As countries struggle to limit their greenhouse gas emissions and decarbonize their economies, there has emerged a space in public life for new ways of thinking about climate change, energy, and politics. In books, essays, and research, a group of intellectuals and scholars calling themselves “ecomodernists” or “ecopragmatists” have put forward a set of ideas that break from conventional thinking, challenging longstanding paradigms about nature, technology, and progress (Fahy and Nisbet 2017; Nisbet 2014). Most of today’s rise in greenhouse gas emissions is driven by energy-hungry Asian nations seeking to rapidly grow their economies and improve the standard of living for billions of people. Between 2006–2016, energy consumption in Asia rose by 40 percent. In India, where emissions are growing the fastest, the country remains highly dependent on coal to produce three-quarters of its electricity. In 2017, the country’s use of the world’s most polluting fossil fuel grew by 5 percent (“The Year” 2018). In Germany, even as the country has made unprecedented gains in the deployment of solar and wind power, emissions over the past two years have slightly increased. In 2011, Germany made the rash political decision to phase out its seventeen emissions-free nuclear power plants, which at the time accounted for 25 percent of the country’s electricity generation. In doing so, Germany has remained strongly dependent on some of the dirtiest coal power plants in the world for more than 40 percent of its electricity. Efforts to cut emissions have also faltered because of unexpected growth in the economy and lower oil prices, which encouraged greater use of home oil heating and car transportation (“Germany” 2017). In the United States, the good news is that emissions have declined since their historic peak in 2007, though they still remain above 1990 levels, according to official government estimates. The decline has been driven primarily by the revolution in shale gas drilling or “fracking,” which lowered the cost of generating electricity from cleaner burning natural gas power plants, putting many dirtier and more expensive coal power plants out of business (Barboza and Lange 2018). Questions remain, however, about how much methane is leaked into the atmosphere from natural gas production and transport. A recent study estimated that the leakage rate was 60 percent greater than the U.S. government had previously estimated. Such a discrepancy is important to evaluating the benefits of natural gas, since the atmospheric warming impact of methane during the first two decades after its release is more than eighty times more potent than carbon dioxide (Guglielmi 2018). A glut of cheap natural gas also threatens the country’s 100 emissions-free nuclear power plants, which generate 20 percent of U.S. electricity. Because the United States does not have a national carbon tax or fee, the climate change benefits of nuclear power plants are not factored into their operating costs. Since 2013, five nuclear plants have closed and six more are scheduled to shut down by 2025, even though these older plants could still operate for decades. In most states, solar and wind power will not be able to take up the slack in electricity generation. Instead, nuclear power will be replaced by dirtier natural gas (Plumer 2017). A bright spot may be California, the fifth largest economy in the world. Even as the state’s population has surged—its economy has grown by 40 percent over the past two decades—the carbon intensity of California’s economy (the amount of carbon pollution per million dollars of economic growth) has declined by 38 percent and is now below 1990 levels. In 2016, the most recent year for which data is available, carbon intensity declined 6 percent even as the economy grew by 3 percent (Barboza and Lang 2018). The shift is driven by a major decline in emissions from the electricity sector. Not only have state-wide improvements in energy efficiency decreased the demand for electricity even as the economy and population have grown, a sharp drop in the price of solar panels combined with state renewable energy mandates have accelerated the transition from natural gas plants to clean energy sources. Rain in the state after five years of drought also boosted electric generation from hydropower (Barboza and Lange 2018). Many challenges remain for California. The scheduled shuttering of the state’s last remaining nuclear power plant may shift some electricity generation back to natural gas. Emissions from cars and trucks, already the biggest source of carbon pollution in the state, continue to increase. Lower gas prices until recently have not helped, nor has consumer preference for bigger, less efficient cars and the relatively slow adoption of electric vehicles (Barboza and Lange 2018). Continued success in California and the United States also hinges on U.S. federal policy. But the Donald J. Trump administration since taking office has installed at major regulatory and scientific agencies fossil fuel industry lobbyists and conservative operatives who have spent their careers casting doubt on climate science and opposing any policies to cut emissions. According to one recent study, the fossil fuel industry and other sectors that are major emitters enjoy a ten-to-one lobbying advantage over environmental groups and the clean energy sector (Brulle 2018). At such a disadvantage, even if Democrats were to win back control of the White House and Congress, any successful climate change–related legislation will not only need some Republican support but also the backing of major players from the fossil fuel industry. But such concessions are likely to be opposed by many environmentalists, who have gained considerable sway within the Democratic party. To win party primaries, Democrats running in districts and states where liberal voters dominate have pledged to promote a “100% renewables” platform that opposes all new fossil fuel infrastructure, seeks a ban on natural gas “fracking,” and demands the closure of nuclear power plants (Nisbet 2015). Brand correctly warned that “soft energy path” technologies such as solar and wind favored by environmentalists were unlikely to be able to overcome the problems of intermittency, storage capacity, and cost and be scalable in time to alter the dynamics of fossil fuel energy use and dependency worldwide. 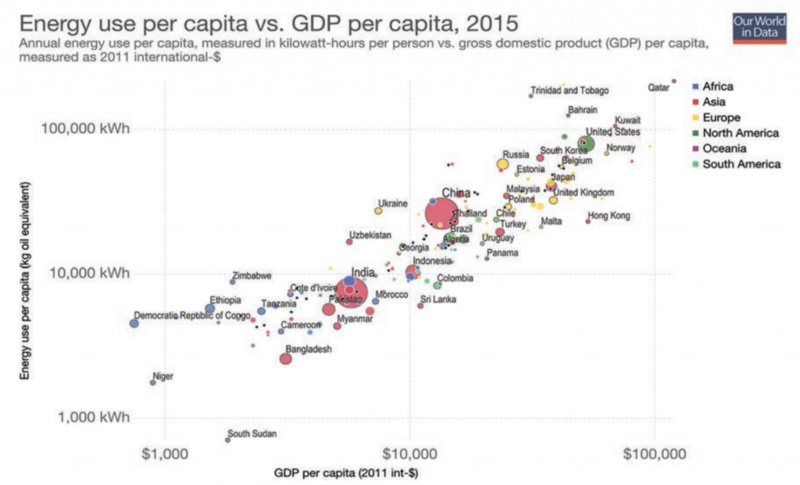 He and other ecomodernists have pointed to the demand for growth in Asia, Africa, and Eastern Europe and the sunk costs that these regions are putting into coal power and other fossil fuels. The more than one billion people worldwide who still lack basic access to electricity means that climate change is a reason to accelerate rather than slow energy transitions, echoed the ecomodernist thinkers Ted Nordhaus and Michael Shellenberger (2007; 2013) in a book and numerous essays. Those countries over the past century that have gained access to abundant, cheap forms of energy have achieved huge gains in economic growth and human security. Today, the main imperative for people living in developing countries such as India is to gain the same access and to achieve a Western standard of living. During the 1960s and 1970s, as North American and European countries achieved economic security and prosperity, their citizens began to put pressure on their governments to accelerate efforts to reduce pollution, slow rates of deforestation, and limit land use, thereby conserving nature rather than destroying it. A similar pattern is occurring in China, which through state-managed economic growth has achieved a rising, affluent middle class. But for growth to continue in China, and for India and other developing countries to also gain access to abundant forms of energy, transformative innovations in “hard energy” path options such as nuclear energy and carbon capture and storage are required, along with similar advances in high-tech solar, energy transmission, and energy storage technologies. These advances would be needed to not only meet the demand for growth in these regions but also limit emissions from the thousands of coal plants already in place and scheduled to be built around the world. In 2009’s Why We Disagree about Climate Change, University of Cambridge geographer Mike Hulme argued that climate change had been misdiagnosed as a conventional environmental problem. Instead, it was what policy scholars referred to as a uniquely “super-wicked” problem, not something society was going to end or solve; like poverty or war, it was something that we were going to do better or worse at managing over time. As a super-wicked problem, argue other ecomodernists, climate change is so complex in scale with so many different drivers that a single omnibus solution such as a national carbon tax or an international emissions agreement is unlikely to be either politically enduring or effective. Instead, policies would be needed to be implemented at the state, regional, and bilateral levels and through the private and nonprofit sectors (Prins and Rayner 2007; Verweij et al. 2006). At the international level, examples include focusing more narrowly on reducing especially powerful, but easier to tackle, greenhouse gases such as black carbon (or soot) from diesel cars and dirty stoves and methane from leaky gas pipes. At the national and state levels, examples of smaller scale policies include government technology procurement programs; major investments in climate change resilience to protect cities, people, and industries; subsidies for renewables, nuclear energy, and carbon capture; funding for clean energy research; and investments in climate resilience efforts. As these smaller successes are achieved, argue ecomodernists, we not only gain more time to deal with the bigger policy challenges but also start to rebuild networks of trust and cooperation across lines of political difference while experimenting with new solutions and technologies (Nordhaus et al. 2011; Prins and Rayner 2007). These ideas and others have been researched, expanded on, and promoted by the Breakthrough Institute, a left-of-center think tank founded by Ted Nordhaus and Michael Shellenberger. In 2015, the two brought together sixteen other similarly minded thinkers to author An Ecomodernist Manifesto. They argued that climate change and other environmental crises are not reason to call into question the economic policies and technological advances that have enabled human society to flourish over the past century. Indeed, halting the many societal gains we have achieved through technological innovation, they argue, rules out the best tools we have for combating climate change, protecting nature, and helping people. The urgent environmental problems we face are evidence in favor of more modernization, not less (Asafu-Adjaye et al. 2015). Hope for a better future, they contend, starts with advanced technologies that intensify rather than weaken our mastery of nature. High-tech crops, advanced nuclear power, carbon capture and storage, aquaculture, desalination, and high-efficiency solar panels all have the potential to not only reduce human demands on the environment but also spark the economic growth needed to lift people out of extreme poverty. These advances will enable more people to live in bigger cities that are powered and fed more efficiently. People in cities also tend to have fewer children, slowing population growth. From this perspective, technological advances and urbanization will free up more space on the planet for nature, “decoupling” human development from fossil fuel and resource consumption. To achieve this future, ecomodernists warn that we have put too much faith in carbon pricing, social-impact investing, venture capital, Silicon Valley, and other market-based “neoliberal” mechanisms to spur technological innovation and social change. We need to instead focus more intensively on understanding how technological advances happen and the role of government planning and spending—rather than the market—as the main driver of innovation and societal change. Once there are technologies available that make meaningful action on climate change and other problems cost less, ecomodernists predict, much of the political argument over scientific uncertainty will diminish. The challenge is not to make fossil fuels more expensive but to make their technological alternatives cheaper and more powerful. Under these conditions, it will be easier to gain political cooperation from across the ideological spectrum and from developing countries. National leaders and their constituents are far more likely to spare nature because it is no longer needed to meet their economic goals than they are for any ideological or moral reasons. Over the past year, ecomodernist ideas have received a boost from Harvard University cognitive linguist Steven Pinker (2018), who in his best-selling book Enlightenment Now devotes his chapter on the environment to advocating on behalf of the philosophy and the need for technologies such as nuclear energy. Pinker is part of a parallel genre of “New Optimist” authors who have been inspired by the work of Hans Rosling and affiliated data scientists. In TED talks, a recent book, and vividly illustrated graphs available at the website Our World in Data, Rosling and colleagues have shown the many ways in which human societies are flourishing in the age of climate change, countering a powerful cultural narrative that the world for decades has been in a state of escalating crisis, decline, and suffering (Rosling et al. 2018). For ecomodernists, technological and political progress also require respectful engagement with a diversity of voices and ideas. “Too often discussions about the environment have been dominated by the extremes, and plagued by dogmatism, which in turn fuels intolerance,” they write in the Manifesto. At their core, ecomodernists believe in applying the Enlightenment principles of skepticism and dissent, which are essential to wise and effective decisions, especially in relation to wickedly complex problems such as climate change. Numerous social science studies demonstrate that in situations where groupthink is closely guarded and defended to the exclusion of dissenting voices, individuals and groups tend to make poorer decisions and think less productively. In contrast, exposure to dissent, even when such arguments may prove to be wrong, tends to broaden thinking, leading individuals to think in more open ways, in multiple directions, and in consideration of a greater diversity of options, recognizing flaws and weaknesses in positions. “Learning and good intentions won’t save us from biased thinking and poor judgments,” notes UC-Berkeley psychologist Charlan Nemeth. “A better route is to have our beliefs and ways of thinking directly challenged by someone who authentically believes differently than we” (Nemeth 2018, 191). Acting on these principles, the Breakthrough Institute has invested in twice yearly “Dialogues” in San Francisco and Washington, D.C., creating the rare forum where progressives, liberals, conservatives, environmentalists, and industrialists come together to debate ideas and to connect over civil, cross-cutting conversations. To elaborate on these ideas, the Institute also publishes the Breakthrough Journal and produces the podcast series Breakthrough Dialogues. On the road to managing the many threats we face from climate change, grassroots activism and political reforms that hold the fossil fuel industry accountable are important, as is the quest for a more advanced arsenal of technological options and a reconsideration of our economic goals. But so too is investment in our capacity to learn, discuss, question, and disagree in ways that constructively engage with uncomfortable ideas (Nisbet 2014). Unfortunately, most academics and journalists avoid challenging the powerful forms of groupthink that have derailed our efforts to combat climate change. In this regard, attacks on those who question cherished assumptions have had a powerful chilling effect. We therefore depend on risk-taking intellectuals such as the ecomodernists to lead the way, identifying the flaws in conventional wisdom and offering alternative ways of thinking and talking about our shared future. Asafu-Adjaye, J., L. Blomqvist, S. Brand, et al. 2015. An Ecomodernist Manifesto. Oakland, CA: The Breakthrough Institute. Available online at http://www.ecomodernism.org/. Barboza, T., and J.H. Lange. 2018. California hit its climate goal early—but its biggest source of pollution keeps rising. The Los Angeles Times (July 23). Brulle, R.J. 2018. The climate lobby: A sectoral analysis of lobbying spending on climate change in the USA, 2000 to 2016. Climatic Change: 1–15. Fahy, D., and M.C. Nisbet. 2017. The ecomodernist: Journalists who are reimagining a sustainable future. In P. Berglez, U. Olausson, and M. Ots (Eds), What Is Sustainable Journalism? London: Peter Lang. Hulme, M. 2009. Why We Disagree about Climate Change: Understanding Controversy, Inaction and Opportunity. Cambridge, MA: Cambridge University Press. Germany is missing its emissions targets. 2017. The Economist (November 9). Guglielmi, G. 2018. Methane leaks from US gas fields dwarf government estimates. Nature 558: 496–497. Nemeth, C. 2018. In Defense of Troublemakers: The Power of Dissent in Life and Business. New York: Basic Books. Nisbet, M.C. 2014. Disruptive ideas: Public intellectuals and their arguments for action on climate change. Wiley Interdisciplinary Reviews: Climate Change 5(6): 809–823. ———. 2015. Environmental advocacy in the Obama years: Assessing new strategies for political change. In N. Vig and M. Kraft (Eds), Environmental Policy: New Directions for the Twenty-First Century, 9th Edition. Washington, D.C.: Congressional Quarterly Press, 58–78. Nordhaus, T., and M. Shellenberger. 2007. Break Through: From the Death of Environmentalism to the Politics of Possibility. Boston, MA: Houghton Mifflin Harcourt. ———. 2013. How the left came to reject cheap energy for the poor. The Breakthrough (July 10). Available online at http://thebreakthrough.org/index.php/voices/michael-shellenbergerand-ted-nordhaus/the-great-progressive-reversal. Nordhaus, T., M. Shellenberger, R. Pielke, et al. 2011. Climate Pragmatism: Innovation, Resilience, and No Regrets. Oakland, CA: The Breakthrough Institute. Available online at http://thebreakthrough.org/ archive/climate_pragmatism_innovation. Pinker, S. 2018. Enlightenment Now: The Case for Reason, Science, Humanism, and Progress. London, UK: Penguin Books. Plumer, B. 2017. Glut of natural gas pressures nuclear power, and climate goals, too. The New York Times (June 14): A17. Prins, G., and S. Rayner. 2007. Time to ditch Kyoto. Nature 449(7165): 973. Rosling, H., A.R. Rönnlund, and O. Rosling. 2018. Factfulness: Ten Reasons We’re Wrong about the World—and Why Things Are Better Than You Think. New York: Flatiron Books. Schiermeier, Q. 2018. Droughts, heatwaves and floods: How to tell when climate change is to blame. Nature 560(7716): 20. Sengupta, S. 2018. The year global warming made its menace a reality. The New York Times (August 9): A1. Temple, J. 2018. At this rate, it’s going to take nearly 400 years to transform the energy system. MIT Technology Review (March 14). Available online at https://www.technologyreview.com/s/610457/at-this-rate-its-going-to-take-nearly-400-years-to-transform-the-energy-system/. Tollefson, J. 2018. Can the world kick its fossil-fuel addiction fast enough? Nature 556(7702): 422–425. Verweij, M., M. Douglas, R. Ellis, et al. 2006. Clumsy solutions for a complex world: The case of climate change. Public Administration 84: 847–843. The world is losing the war against climate change. 2018. The Economist (August 2). Available online at https://www.economist.com/leaders/2018/08/02/the-world-is-losing-the-war-against-climate-change. The year global warming made its menace a reality. 2018. The Economist (August 2).